Behavioral adjustments may allow organisms to cope with the drastic environmental change caused by urbanization. We compared the escape behavior of Anolis lizards during simulated predator approaches on trees in both urban and forest habitats and on artificial structures (i.e., cement walls and metal posts) in urban areas. We found that urban lizards were less wary on trees, likely due at least in part to habituation to humans. In contrast, lizards on cement walls showed greater wariness, which may reflect a behavioral modification when escaping because of poor locomotor performance on this substrate. In both habitats, lizards modulated escape responses in ways consistent with their performance abilities on the various substrates. Escape by jumping decreased when lizards used wider and more isolated perches, which are characteristic of urban sites. Urban lizards squirreled (i.e., moved to the opposite side of a structure) more on wider trees and metal posts, and sprinted more but never jumped from cement walls. 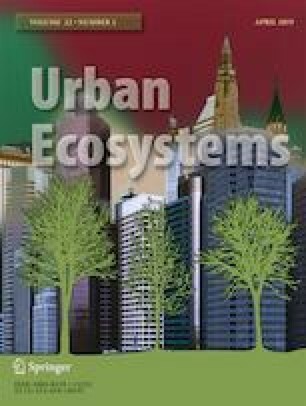 These behavioral responses for predator escape are consistent with the structural habitat changes caused by urbanization. Urban habitats had larger diameter trees, sparser ground vegetation, and many artificial structures. We found that urban lizards showed behavioral modulations because of exposure to humans as well as the locomotor constraints of using some artificial structures, such as cement walls. The ability of urban lizards to alter their escape responses and adjust to novel features of the habitat may be important traits of species able to colonize and persist in urban areas. The online version of this article ( https://doi.org/10.1007/s11252-019-00845-x) contains supplementary material, which is available to authorized users. We thank Scott McWilliams, Evan Preisser, Liam Revell, Oriol Lapiedra, Chris Thawley, Kristen Winchell, and members of the Kolbe Lab for helpful feedback on this manuscript. We thank the University of Puerto Rico and Jardin Botánico Sur for access to our field sites. This work was supported by funds from the University of Rhode Island, and grants from the National Geographic Society and the National Science Foundation (DEB-1354897). The University of Rhode Island Institutional Animal Care and Use Committee approved protocols for use of live animal in this study (AN11-09-005) and Natural Areas Management of the Miami-Dade Park & Recreation Department granted permission for this research in Matheson Hammock Park.